Enhance your experience with this chic white square counter height table that lends a more casual feel than traditional dining tables. Improving its functionality, a hollow core base provides added storage space with three open shelves perfect for showcasing extra dining accessories. Added storage space with three open shelves perfect for showcasing extra dining accessories. Add flair to any kitchen or create your own place to relax with friends with the DAW-510-T bar table. Featuring a chromed gas lift that adjusts the white wood finish table top to variable heights with ease. Add a contemporary touch to any setting by mixing or matching with any CorLiving barstool to get your own unique style. A great addition to any home! 32-inch x 36-inch White Counter Height Dining Table with Shelving in White Enhance your experience with this chic white square counter height table that lends a more casual feel than traditional dining tables. Improving its functionality, a hollow core base provides added storage space with three open shelves perfect for showcasing extra dining accessories. 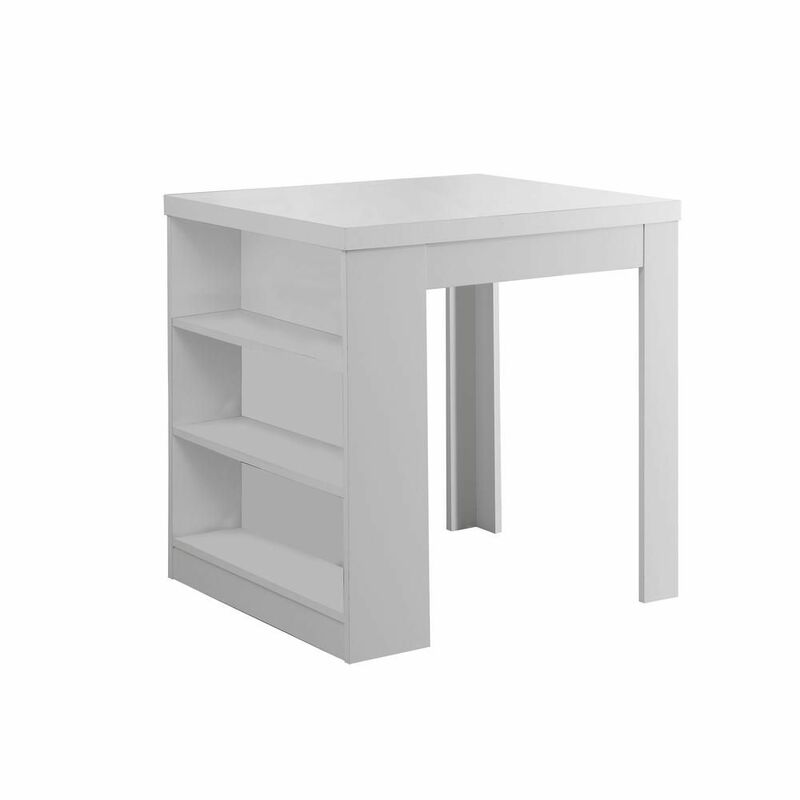 32-inch x 36-inch White Counter Height Dining Table with Shelving in White is rated 4.2 out of 5 by 11. Rated 4 out of 5 by Karen from This table was the perfect size for my new craft... This table was the perfect size for my new craft room! The shelves on the side are perfect for storing my supplies, and the fact that they are adjustable is an added bonus. Suggest two people for assembly, and study the assembly instructions carefully before putting together. Great for the price! Rated 5 out of 5 by Wendy from This table is exactly what I wanted. Using in... This table is exactly what I wanted. Using in my craft room. Assembly instructions were intimidating but I managed. Rated 5 out of 5 by Lexiclown from I purchased this pub table to use as a place... I purchased this pub table to use as a place to put my photo lighting kit.It'a a little bigger than I needed, but I love it.The shelves in the front are perfect for holding the items to photograph.Nice piece of furniture. Rated 5 out of 5 by Bls from Fits perfect in our kitchen fir added counter height space (instead of a non used breakfast table... Fits perfect in our kitchen fir added counter height space (instead of a non used breakfast table). We added two white stools that push underneath when nit in use. Very happy about this purchase. Only con is there are obvious shelf holes running up the dudes. Wish they included white hole plugs. Rated 5 out of 5 by dunph from Great product Easy to assemble and worth the money that you paid. Rated 5 out of 5 by ARod from Helpful to have 2 people assemble. Has a slightly glossy... Helpful to have 2 people assemble. Has a slightly glossy finish, not exactly flat but definitely not lacquered. Perfect for a small space! Rated 1 out of 5 by HomeDepotCustomer from Awful heavy pressboard and impossible to assemble.... Awful heavy pressboard and impossible to assemble.